This story time series focuses on the natural world through stories and hands on activities that focus children’s attention on the natural life of plants and animals within Brower Park. This weekly summer series is being presented through a partnership of the Brooklyn Public Library, Brower Park Branch and the Friends of Brower Park, Inc. Pre-schoolers and homeschooled children will have a hands-on opportunity to interact with Brower Park’s natural and landscaped plant and wild life. The natural world, the world in which we humans conduct our lives, often goes unnoticed. The change of seasons, birdsong, the work of worms, seems irrelevant to our everyday urban sidewalk lives. By bringing children into the environs of Brower Park’s natural ecosystems we hope to build on children’s natural curiosity about the world around them and to provide hands-on gardening activities that make the stories come to life. So be prepared to get your hands dirty. It’s the only way to experience and learn about the natural world. 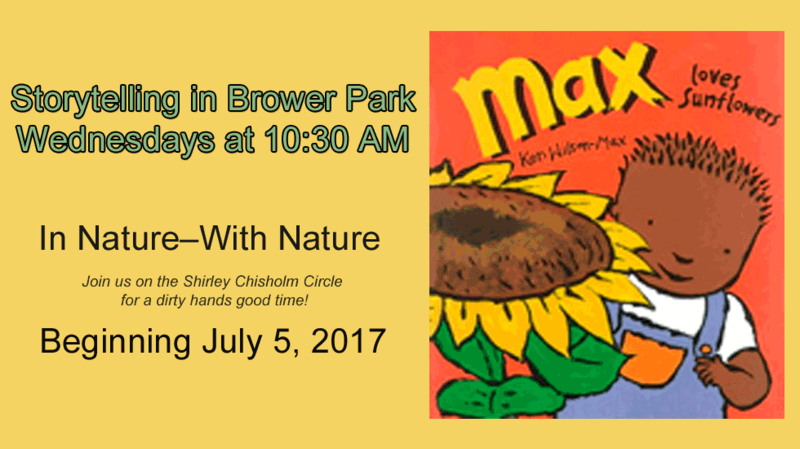 We will begin our series with “Max Loves Sunflowers,” by Ken Wilson-Max, on July 5th at 10:30 AM. Followed by the planting of Mammoth Sunflower Seeds in park beds. These seeds were harvested in Brower Park’s Monarch Butterfly Garden. Gardening tools will be provided.